Marelle Taylor Stampin' Up! Demonstrator Sydney Australia: How could you resist? Resist techniques, that is! I taught a class this week called "Ir-resist-able" and we did 3 resist techniques. This one is crayon resist, and we also did versamark resist and emboss resist. I'll show you those cards over the next couple of days. 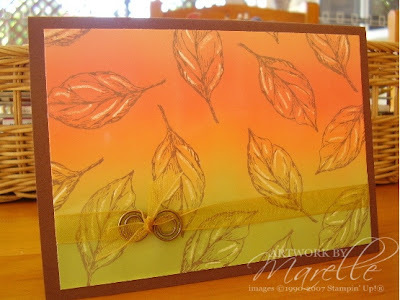 To make this card, stamp the leaf from 'Natural Beauty' in Chocolate Chip ink on a piece of white gloss cardstock. (I prefer to use a piece that's larger than I actually want it and then trim it to size. That way you avoid getting fingerprints which also resist the ink!). Next, colour the parts of the leaf that you want to remain white using an ordinary kids white crayon. The next step is to brayer ink from the 'Pumpkin Patch' Kaleidacolour inkpad onto your glossy card. Trim to size, embellish with gold organdy ribbon and Hodgepodge, and attach to a Chocolate Chip base card. oooooooo I really like this Marelle!! Absoloutely gorgeous! Oooooh.. I havent tried this technique yet, but really want to. Thanks for the inspiration... lovely card! Marelle, this is simply stunning!